Like all practitioners whose life has been dedicated to their art, Shihan Andrew Roubas, eighth Dan in Goju Ryu Karate, becomes philosophical when making sense of it. For Roubas, this metaphor is especially apt, working as he does as a painter. Both painting and Karate have given him a strong set of principles which inform everything he does. Perfection, or the ceaseless striving for it, is the essence of his philosophy and the way he engages with karate. Roubas emigrated from Greece in 1970, at the age of twenty-five. As is so often the case, martial arts gave Roubas an extended community in his new home. Karate, given its Japanese heritage, also provided a space in which Roubas’ ethnicity was parallel to that of the other Australians he trained with. The language barrier was surmounted by the essential nature of training in the martial arts. 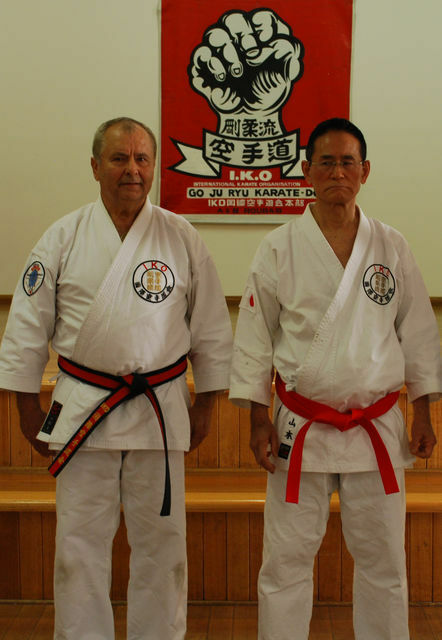 Roubas has been involved in karate, both training and teaching, for over forty years. In that time, both his focus and practice have evolved. “The thing that attracted me in the beginning was the sparring; the discipline and the respect for fellow karateka. But as I’ve gotten older, I realize my values are more focused on the training and educating [of others]; the family and friendship aspect of the club and the students involved in the art. Kata isn’t an archaic feature of practice in Roubas’ syllabus. Both ippon and full-contact kumite are an important part of the syllabus at Roubas Goju Ryu. Some students will stay after class to practice kumite amongst themselves. Self defence is also a feature. Andrew has supplemented his training by branching out and studying the use of weapons. “Kobudo weapons training is a big part of my karate,” he says. “When you have a good karate base, the weapon becomes an extension of the body. And when you learn weapons, anything that you pick up can be used as a weapon. Andrew Roubas enjoys close ties with the Japanese hub of the Goju Ryu karate organization, especially Soshihan Gonnohyoe Yamamoto. After that, Roubas travelled to the home of karate to train with his mentors. Travel to Japan has been an important part of Roubas’ training and ongoing education. Andrew has also bought Yamamoto to Australia for the benefit of Australian students of Goju Ryu. Yamamoto himself has been an inspirational part of Roubas’ journey as a karateka, beginning from his stint as an uchi-deshi. “Yamamoto… looked after me and opened my eyes to Japanese customs. One of my most treasured moments of that Japan trip was when Soshihan invited me to his house for dinner on my final night and presented me with a shredded black belt that was barely held together as a gift to remember him. Over forty-five years, Andrew Roubas has made the transition from student to teacher, the well-worn path which shreds every black belt. In that time, every aspect of his art has changed. “I am sixty-eight years old,” he says, “But please don’t tell my students. They still think I am 21! “Before, I was always very aggressive in my kumite. But as I have gotten older and have more experience, I have learnt to wait for the right opportunities and get aggressive only when the time is right. The point of entry to that common path is different for every student, and experience has helped Roubas develop the acumen to choose how to involve every person in the way that best suits them. Just as different students struggle with different aspects of karate, so too do different teachers excel in different areas. One of the most appealing aspects of Roubas Goju Ryu to the community at large is that while many dojos proclaim they are family-oriented, Andrew teaches alongside one of his longest, most enduring students, his son, Stefan. “It’s like a gift having my son train with me,” he says. “Many other instructors I know have children that haven’t continued training with their fathers. Aside from boosting the number of staff, karate has forged an especially strong bond between father and son. Having one’s father as sensei is not always beer and skittles, however. “Having your father as a sensei is a very unique situation,” says Stefan. “As a child, my father always made me the example and picked on me so that all his other students could benefit from my correction. Having his father as a sensei meant that Stefan had to develop a sensitivity to a situation which operated outside the boundaries of both karate and family. One of the most interesting aspects of Stefan’s practice is that he works as a civil engineer and in a truly eastern way, sees a correlation between these two modes of work. “Being a Civil Engineer… allows me to see the science behind karate. Body mechanics. Equilibrium through the body. How the body battles against gravity and generates force through the feet. Karate, and martial arts generally, are a metaphor for living. Often people not only find the skills to live life, such as discipline, but they also develop a means to talk about it. Roubas Goju Ryu is a place where family focuses on the art of karate. This entry was posted on April 30, 2015 at 5:18 am and is filed under fighting, Journalism, Martial Arts with tags dojo, eighth Dan, Goju Ryu Karate, Granville, Greece, Japan, Karate, kata, kobudo, kumite, military, Roubas Goju Ryu, self-defence, Shihan Andrew Roubas, Shihan Con Hardas, Shihan George Barounis, Shihan Merv Oakley, Shihan Stefan Roubas, Soshihan Gonnohyoe Yamamoto, Sydney, Uchi Deshi, weapons. You can follow any responses to this entry through the RSS 2.0 feed. You can leave a response, or trackback from your own site.